1958 IA Registration sticker - $20.00 : Bob Hoyts Classic Inspection Stickers, Add a Final Touch to your Restoration! 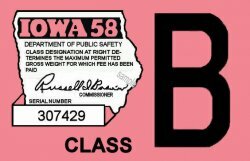 This 1958 Iowa registration tax sticker validated the license registration. The vehicle could not be on the road in 1958 without this sticker.